The Audio-Technica BP894 Microset is a subminiature cardioid condenser headworn microphone with an innovative rotatable capsule housing that can be turned to aim the microphone directly at the user’s mouth no matter which side of the head the unit is worn. Available in standard black or theater beige, a microphone diameter of just 2.8 mm makes for a very discrete package. The cardioid pattern uses a fixed-charge, back-plate, permanently polarized condenser element that delivers a stated frequency response of 20 Hz to 20 kHz and maximum SPL handling of 135 dB. The BP894 is available in wired and wireless versions, and can be ordered terminated to match specific wireless system belt pack connectors or un-terminated. The specific model used for this review -- BP894cW -- was outfitted with a locking 4-conductor connector that fits all A-T UniPak transmitters, with other options including Lemo, locking 3.5 mm, and Ta4F. The wired models require between 11 and 52 volts phantom power for operation, while the wireless units get their power from the belt pack. The BP894 ships in a sturdy foam-lined plastic case that houses the mic, the AT8464 dual-ear mount, and a windscreen. 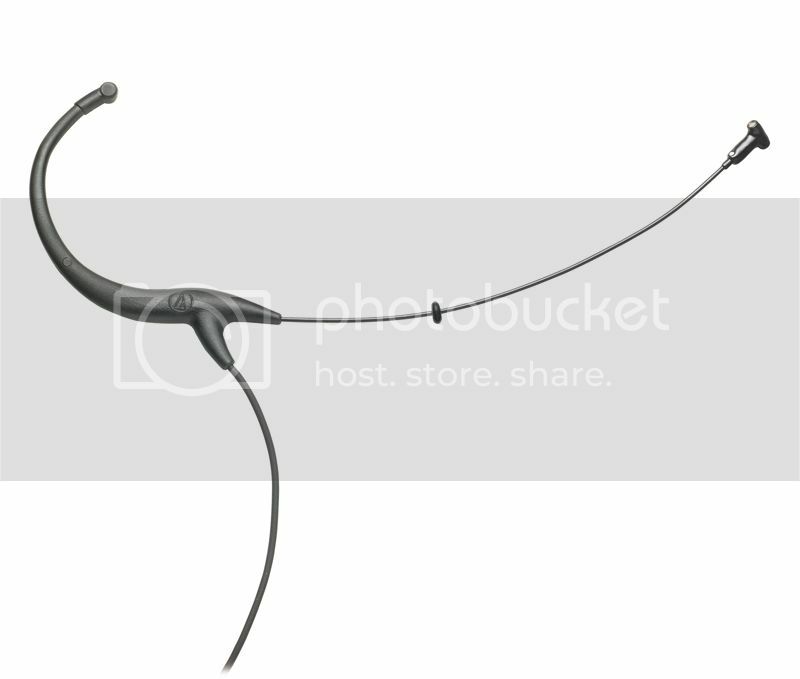 A 55-inch cable with rugged strain relief is permanently attached to the ear mount. The cable is solidly attached and after handling the mic for a few minutes, I had no worries of the connection coming apart under normal usage. The ear mount is quite comfortable, and the after bending the loop to fit, the mic stayed securely in place. Wearing my glasses while using the mic also proved to be comfortable, and the length of the cable made it easy to optimally position the element to account for head movement. The AT8464 dual-ear mount converts the unit from single-ear to an even more secure headset style. It accommodates both left- and right-side head positioning, along with a very wide range of adjustments that allow it to fit both adults and children. As noted earlier, the capsule rotates, allowing the cardioid pattern element to face the mouth while offering excellent rejection of outside noise. This high gain before feedback is especially much wanted -- and often much needed -- in live settings. A-T also provided a System 10 digital wireless system for use with the mic. While not a true touring unit, it's a really nice system that operates in the 2.4 GHz band, and up to eight systems can operate simultaneously. At the shop, I tried the BP894 with both male and female voices and the audio quality was nothing short of great. 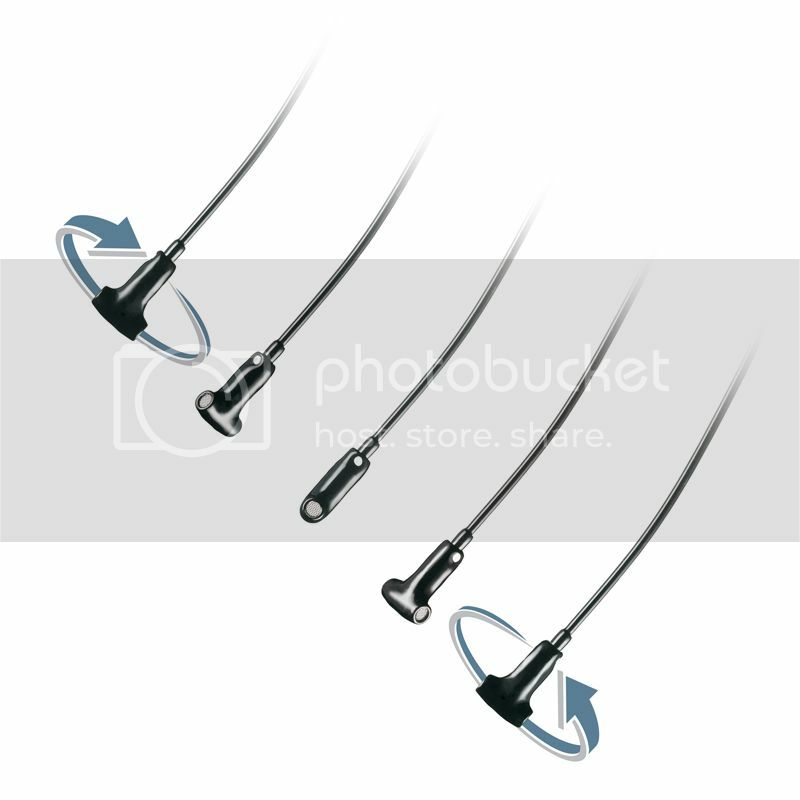 The ear mount was easy to adjust for everyone’s ears, and it stayed secure, while the mic boom was easily bent into a position that hugged their face. After getting familiar with both the mic and wireless system, and satisfied that they were both working correctly, I took them out to a great application for them, a local theatrical production. Setting up the System 10 on-site was as easy as placing the receiver on top of the other wireless rack and plugging it in. The receiver scans the airways and selects a pair of frequencies for the transmitter to operate on. That’s right -- I said a pair. The system transmits on two frequencies, with the receiver choosing the one with the best signal. The system also scans for, and chooses, backup frequencies that the system can use in case of interference on the selected frequencies. They switch in automatically if needed, with a seamless transition. I used the mic and wireless transmitter while we set up and tuned the house system, and then kept them ready as a spare because the production director had requested lavaliers rather than headworn mics. However, after seeing how small and unobtrusive the BP894 actually is, she asked me if we could use it with a performer who had a big role but struggles with vocal projection. I set up the mic with the dual-ear mount and also reconfigured it from single-ear style to headset style in less than a minute. During rehearsal, it sounded absolutely great, and there was also a lot more volume and headroom than we would have gotten with a clip-on lav, so it was an easy decision to decide to use it for the actual production. With its ability to handle high sound pressure levels, the BP894 is also an excellent option for singers and presenters with loud voices. The sound quality is superior, while the adjustable element maximizes gain before feedback while also providing the luxury of flexible positioning. Top it off with the ability to quickly and easily switch between a single- or dual-ear, and this is a highly recommended microphone for production companies, churches, and performance venues of all stripes. "One size fits all" is often anything but; however, in the case of the BP894, it truly is a single model solution for every headworn mic application. And they still haven't learned from the competition. I will not be buying or recommending these, which is a shame because I liked the original less fancy version when I first got one. The major flaw is the one piece design. When the cable goes bad because "helpful" people wrap the mic around the bodypack a few too many times and the $300+ microphone crackles during use your only option is replace or send back to AT for repair. There are just too many good alternatives in the same price range to give these a second thought. I have two of the original microset versions that are sitting in a drawer and just aren't worth the cost of repair. In the same price range, the dual ear from Rode is a great, modular and relatively natural sounding option. If you want the cardioid pattern facing the speaker the d:fine from DPA is an excellent modular option. Spare cables from DPA are less than the out of warranty repair from AT IIRC.